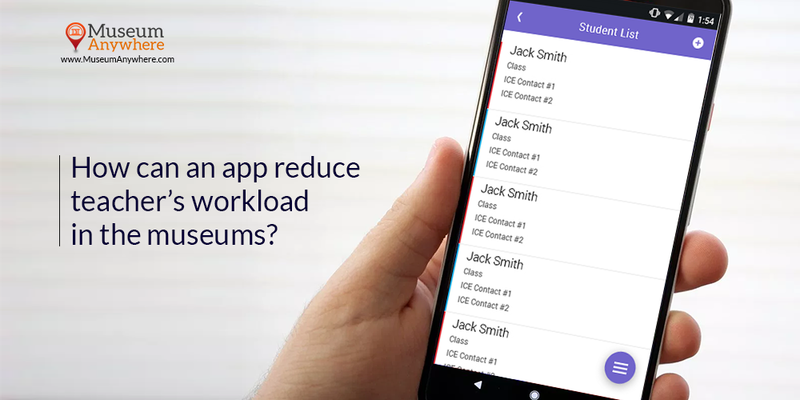 How can an app reduce teacher’s workload in the museums? Home/Blog/How can an app reduce teacher’s workload in the museums? Over the past few decades, there has been an immense influence of technology on education. Education was once equated with money, but now the things have changed. Earlier the teachers had to face challenges to manage the each student’s activity. But with Teacher app, education is no more like a dream but it has been made possible for the teachers to manage all the tasks related to the students. The app is exciting and fun to go. Please Continue to read more….. The apps developed at MuseumAnywhere are custom built. The solution is mainly targeted for the school groups where the teacher can put in student lists, assign chaperones and many features that we will be discussing below. The apps are built with CMS (Content Management System), which means you can easily make the content changes in the app whenever you want. With students belonging to all age groups, you can create experiences accordingly depending on the difficulty levels. Teachers can manage all the tasks right from the dashboards. Teachers can assign chaperones to the students where they can have access to the dashboard to get the basic and required details of the student. An itinerary can be created for the tour within the app based on the interest. Student’s permission slip, ICE numbers, medication, spending money can easily be tracked. The assigned Chaperones can view the dashboard with ICE numbers, allergies, medication of the students in the groups. As we all know how gamification excited the students, so our solution does have the gamification feature that makes learning fun. How about a reward system? You students so love being rewarded for their performance. Isn’t it? You can generate virtual trophies and paper certificates for each group within the app. This is going to be a motivational factor for the students. So this was all about how a teacher app can make the tasks easier without falling into the pit of hassles. If you too have been looking for any such option, then I hope your search is over. Get in touch with our expert who would tell you in a more detailed way. Next Next post: Why Should Plastic Membership Cards go digital?